As a podiatrist, I team up with orthopedists to treat many knee conditions. One of the most gratifying is the treatment of lateral knee compartment disease. In attempt to avoid complete or partial knee replacements, I am asked to varus or medial wedge them to open up the lateral joint line. I can not tell you how successful it is, but I have many very happy patients. The treatments are always teamed with a variety of other treatments, including synthetic cartilage injections, knee braces, knee strengthening, shoes selection, icing, and some cortisone shots. I have enough very happy patients who presently are avoiding surgery, and love their wedges, that I thought I would share this video with you. This video below discusses the measurement required to make the diagnosis of Hallux Limitus vs Hallux Rigidus along with the self mobilization techniques to improve your range of motion. Please enjoy!! I just wanted to send you a note to say thank you so much for taking the time to write your blog. It has been a huge help to me over the last year as I've gone through the drama of a sesamoid fracture. I thought I'd share my story with you. I'm sure you've heard plenty that are similar, but I hope you don't mind adding one more to the list. I fractured my lateral sesamoid (I think - it's the one closest to my 2nd metatarsal) July 2012. I was referred to a podiatrist, and at my first appointment she diagnosed me with a stress fracture of the 2nd metatarsal even though I kept saying that the source of the pain was right around that sesamoid. Nothing was showing up on xrays at this point so she told me that it had to be the 2nd metatarsal and that the pain was just deflecting for some reason. I was put in a walking boot for 6 weeks, which I diligently wore until I was told I could start to wean myself out of it. A week after I was finally out of the boot completely the podiatrist told me I could start a walk/run routine and build up slowly, as well as slowly begin swing dancing again (a hobby that my husband and I do together). I danced for a total of 30 minutes in 1 week and my foot ended up swollen and in more pain than before. I couldn't get in to my podiatrist for a week, so I put myself on crutches, ice, and elevation until I could get in to her. By the time we got to do an MRI a week after the swelling, I had managed to get all the inflammation down, but could not get comfortable in the walking boot again. So the podiatrist suggested spica taping and a dancers pad in walking shoes. The MRI also showed a fracture on the sesamoid at this point but nothing wrong with my 2nd metatarsal. So, I started doing my research online and found your blog, watched your videos to learn how to tape, and went from there. I used your taping method and a dancer's pad for 6 months straight while I went through the rest of my story. Dr Blake's comment: A bone stimulator would have been great at this point, and some discussion of dietary calcium and Vit D3, and the use of icing and contrast bathing daily (my favorites). By January 2013, my husband and I had to move to a new city for work, so my podiatrist sent me on my way with a referral to a PT for 6 weeks to try and get my foot healed completely in our new location. Four weeks into PT, the PT told me she thought I still had a fracture based off of my reaction to ultrasound therapy, and sent me for more xrays/MRI and suggested I go to a new podiatrist. My regular doctor also sent me to an orthopedic surgeon for another opinion. These xrays and MRI showed the fracture had not healed, the bone was fragmented, and there was signs of necrosis. Dr Blake's comment: Necrosis alone can be treated with bone stimulator, necrosis with bone fragmentation sounds surgical to me. The orthopedic wanted me to just stay off of my foot for another 9 months and see what happens. Just taping and a dancer's pad was all he wanted (oh, and he said soft-soled shoes, which I found really bizarre after reading your blog). I wasn't happy with a wait-and-see solution, as I had pretty much done that for 9 months already and couldn't understand how another 9 months would help. The new podiatrist, on the other hand, felt that with the state of my sesamoid it would be wisest to remove it. He said he didn't see much hope in it healing considering the damage he was seeing, and that we were at the stage of last resort. Normally I do not jump on the surgery band wagon quickly, but I didn't see much of an alternative either. Even the orthopedic had given the same diagnosis on my bone, he just wasn't willing to cut it and was hoping for a miracle. I queried e-stem but the podiatrist said I probably had about a 30% chance of that working, and considering I had just found out I was pregnant he didn't think the crutches for 9 months would be a safe idea. So we waited until I was in my second trimester, got my midwife and an OB to both approve the surgery (they also felt it was better to take the bone out before baby was born so I had more time to heal before caring for a newborn), and made a plan with an anesthesiologist to do the whole surgery with a block instead of a general anesthetic. I took the brave step and had the sesamoidectomy 2 weeks ago, 13 months after this whole thing started. The good news is that the bone ended up not necrotic or fragmented when they got into my foot. It came out all at once, but either tissue or cartilage (the doctor said he'd have to order a lot of labwork to tell) had grown into the fracture, so the podiatrist said that it never would have healed properly and it was probably good we took it out (I hope this sounds right. It was a little overwhelming to hear right after surgery). Dr Blake's comment: I hate MRIs for the read of avascular necrosis. It scares many patients into unnecessary surgery when bone stimulators can help. I am unclear however how the bone fragmentation was not fragmented. I think MRIs show more internal disarray that we read as external disarray (ie. fragmented). But, soft tissue in the fracture would mean it could not heal. So, let's accept that as fact. Although I'm only 2 weeks out, and still non-weight bearing (I go for my 2nd post-op appointment this afternoon to see if I'm ready to start moving into weight bearing), I'm amazed at the difference I already feel. I used to get sesamoid pain even sitting on the couch or lying in bed, and now I don't. I haven't really needed any pain killers except for maybe a couple of times in the last 2 weeks. Normally the pain is staying below a 2 (yay good pain! ), and icing the back of my knee (a trick one of the OR nurses taught me in recovery) reduces the swelling enough to lower the pain if it gets any higher. I have a little bit of weird nerve sensation in my big toe, but I see from some others on your blog that this seems to be a fairly common feeling post-surgery. Again, I just wanted to thank you for your blog. Your different posts on this issue has been helpful to read and has made it much easier for me to know what to ask and what to expect. I'm hoping that my foot continues to feel as good as it does now, but I'll admit I'm slightly nervous for the weight-bearing stage. When I treat injured patients, who come in with pain, crutches, limping, boots, etc, the immediate goal we have is to get normal motion back. Because movement is vital to life. When lost, devastating. This is sent by my friend Kenn. Thank you for thrilling with movement. Simple movements, complex movements, and scary movements. Movement defines our health, gives us vitality, gives us a sense of well being. We need to never stop moving when life allows us to keep on going. Hang on to your seat, and turn up the sound! Things I'm sure I can't do, maybe you can't either. Although, I might still be able to do the last one! I have been diagnosed with sesamoiditis and have had this foot pain for over a year now. It is beginning to develop in my other foot as well. I have tried almost everything imaginable: two different orthotics, cortisone injection, active release, had a chiropractor tape the joint with kinesio tape and even one of those electric wave machines. Attempt some form of better diagnosis (xrays, etc). Ice pack the area for 15 minutes twice daily. If swelling or stiffness noted, do contrast bathing once daily or once every other day. Find a shoe that works best whether it is padding or stiff or flat, etc. Try to decide what is best. Put your self in the Immobilization Phase I of Injury Rehabilitation by staying in an Anklizer removable boot or Ovation Medical Boot with EvenUp on the other side. Spica tape your toe daily. See if your doc will prescribe voltaren gel or flector patches for you (at least for when you sleep). Figure out if either of the two pairs of orthotics actually do protect the ball of the foot (we need function not number of). To specifically deal with the pain, see a pain specialist. Avoid NSAIDs since you could have a bone injury. See if any other activities you are doing daily is irritating things and make some change. Apply Neuro-Eze to the sore area 3 times daily (buy online). Do Metatarsal Doming and Single Leg Balancing daily to keep some strength in the foot (painlessly). This was a comment on my tailor's bunion video on my youtube channel also entitled drblakeshealingsole. I have a question about the tailor bunion...does this seem to come on suddenly and feel as if one is stepping on a rock? I did so much googling on internet for days and could not find anything for the longest time. The location of my foot problem is in the tailor bunion area. But it seems I have other symptoms that don't match. About 4 months ago I stepped out of the pool and felt like I had a rock stuck in my foot but nothing was there! Hurt sooo bad. It seemed to be slightly red/bruised..it was exactly where I have a mildish callous on the bottom of foot below pinky toe. It went away after a while and I forgot all about it. Then a couple of days ago..boom out of nowhere it happened again! (walking in my kitchen minding my own biz). I took a closer look with flashlight and the area (on bottom of foot where callous was) was a little red and when I put pressure on it I could see a sort of star shaped white-ish area inside below the skin...did not have that on the other foot. (it's not a plantar's wart). So I pushed on it for a while and took some pics of it. About five hours later it was all bruised up (but maybe that is because I was manipulating it so much). Also when standing only, the bone below the toe on the top of my foot appeared to be protruding more so than the other foot..I really freaked out about that but concluded it was from the area being swollen. I really don't think it is broken. I can move my toes and everything just fine. I'm so bummed because I've been slacking in exercise and was planning to start walking/jogging again. I typically show my patients with plantar fasciitis some simple and more complex ways to tape their arch. Recently, one of my patients has been using this technique with great results. Last winter I walked with Ice Traction Cleats for a long time. 1 hour every day for 4 months at least. After that I one day suddenly felt numbness of the ball of my left foot. I tried talking to a chiropractor who believed there was a problem with the piriformis because I take B12 shots near to this muscle and the piriformis might have been hit. I have tried to stretch this muscle, but no relief. I have also talked to my doctor who did not believe in the piriformis theory and found nothing after MR. The numbness is still the same after 7-8 months and has also occurred in my right foot, but not as strongly. I feel the numbness all the time, but sometimes it gets worse. I am not diabetic. Looking forward to suggestions. Thanks! Dr Blake found a video that may show a similar type cleat. First of all, no matter what the cause start massaging Neuro-Eze into the area 3 times daily. Neuro-Eze is a homeopathic topical that concentrates an amino acid L-Arginine. It works on over 50% of my patients with your symptoms. One bottle will last about one month and it is helps keep going. If it does not help, ask your podiatrist, or primary care, to give you an Rx on a compounding nerve lotion or gel. Piriformis syndrome was a good thought since the motion of telemarking, like a ballerina's turnout, overuses the piriformis and can cause irritation to the sciatic nerve there. I am not sure exactly how you moved, but it probably was differently than you walk normally. But, you can also irritate the same nerve at the low back, in the spine itself to the neck, in the hamstrings, behind the knee, in the calf, and on the inside of the ankle. There are many choices you have. Typically you seek a physiatrist or neurologist to help you sort out where the nerve is being irritated, while you start treatment on the symptoms. Many would also start you on an evening dose of nerve meds like gabapentin, lyrica, or elavil to help calm the nerve down. The faster you act on an upset nerve the better!! 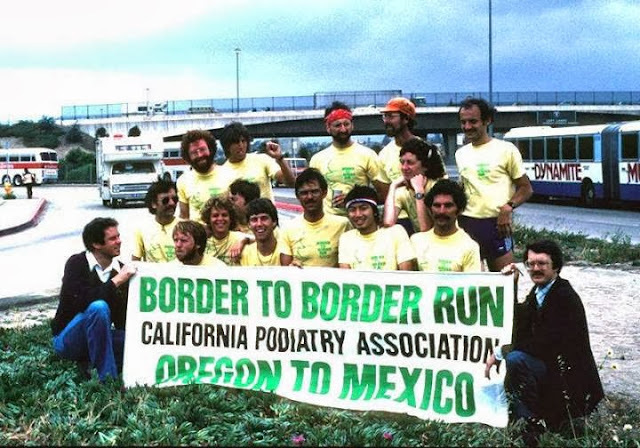 During my second year of podiatric residency, I joined with 9 other runners and 4 alternates to run from Oregon to Mexico as a Publicity Stunt for the California Podiatry Association. I am right between the R of the first Border and the TO (rather dorky looking) in the first row---always got to be in the spot light. It will always be the most unbelievable endurance event in my life. I ran 125 miles in 7 days! I ran from Feb to early May building my mileage from 0 to 70 miles per week. My weight went from 236 (Medical Residents eat not exercise!!) to 184 during my training, and then to 174 by the end of the week. We started at the Oregon Border with 2 vans--5 runners and 2 alternates in each. The 2 alternates were in charge of every detail besides running. We had 10 hours to run 70 miles, yes averaging 7 minute miles, and then transferred the baton to the next van while we were supposed to drive 70 miles down the course, ate and sleep. We had some much PR work to do (radio, newspaper, and TV interviews) that 8 hours of sleep typically became 5 or 6. We went down the state on 101 then over to Sacramento through Clearlake. After Sacramento, we ran down to San Francisco, and through the peninsula to Pacheco's Pass. We ran day and night, 24/7, with each group sharing some of the most dangerous sections. The entire course was pre-approved by the Highway Patrol. We ran on to Fresno for more PR opportunities and then back to San Luis Obispo. I was so sick by then that one of my fellow runners, Matt Fettig, ran 4 of my miles for me!! I was upset since that meant I would only do 121 miles that week. From there we headed now the coast to San Diego, finishing actually 7 days from when we started. From then, I started my podiatry practice one month later. I have so many memories of that event, and have had so many inspirations from this group. Closest to me are Dr Jane Denton (female on the lower right) who has her elbows on Dr Chris Yee (Hawaii) and Dr Dave Hannaford (Marin County and famous for the Hannaford Orthotic). Dr Jane Denton has been my podiatric partner now for 30 years, and one of my best friends. Between me and Dr Yee is the true mastermind of this adventure, Dr John Colson. John practiced in San Diego, and was on the committee that agreed with this scheme. John and I were best friends, and with my being at the California College of Podiatric Medicine, called and see if I could round up 8 other runners. They were easy to find in podiatry school. In 1981, Podiatry was truly at the forefront of sports medicine with biomechanics, and students filled the schools (like me) hoping to have a sports medicine practice. Next to me to the left is Dr Pamela Sisney who practices in Cincinati. Next to her to the far lower left is Dr Kevin Kirby, whom sent me this photo, and is the biomechanics guru of our time in podiatry. Dr Kirby (I refer frequently to the Kirby Skive) practices in Sacramento, California, and lectures around the world on biomechanics. Holding the sign, next to Dr Kirby, and obviously not a runner (but a good friend) is Dr Richard Green who practices in San Diego. Dr David Laha (whom we called Layaway) is in the upper right and practices in Kansas, and in the upper left holding his hands out is Dr Steven Palladino whom practices in Santa Rosa. Dr Robert Eckles and Dr Matt Fettig are next to and under him respectively. Dr Paul Resignato stands in the upper middle with his cool bandana!! Thanks for letting me relax and remember times that I didn't sit so much!!! Thank you for creating and maintaining your blog! It is a great read and full of incredibly useful information. Dr Blake's comment: Thank you so very much!! I recently completed a thru-hike of the John Muir Trail, and my Achilles tendon was very tight and sore for the last five days. At the time, I did not know how to stretch or tape it so as to reduce pain and the risk of injury. How do you recommend I prepare my feet prior to long-distance hiking and walking? And how do you recommend caring for your feet during the hike? I am doing a 700 mile trek next Spring, and I would like to avoid any complications. Hello Dr Blake my name is Ron (name changed) and I live in Oregon. I have be diagnosed with Posterior Tibial Tendon Dysfunction. In 1988 I broke my Left ankle in a fall and and as a result I was left with a slight loss of dorsiflexion but not enough to keep me from running and riding my bicycle. I had a 20 year career of racing bicycles = Cyclocross which is riding and running without any problems. I have always known that I was limited in dorsiflexion but it was never a limitation for me. In December of 2012 I bought a pair of shoes that have no built up heel so the thickness of the heel and fore foot are the same thickness. They felt great and seemed to make my feet feel like they were getting stronger. At the same time I was skate skiing every weekend and began to develop a pain in my foot after skiing that would go away during the week and come back after skiing. This continued to develop into more pain centering on the navicular bone. My own theory was that the shoes without any heel height made my foot come into dorsiflexion sooner than if you were wearing a heel which pushed my foot into pronation. Dr Blake's comment: This was my exact thought when you mentioned the zero drop shoe. Not good if you have limited ankle dorsiflexion, and it is not merely an achilles flexibility problem. It took several months to figure out what was going on and now I have some orthotics which have helped quiet the pain in the navicular down some but not completely. I have new shoes with heels that let my foot not have to go into dorsiflexion so quickly. I am able to ride my bike with stiff cycling shoes and a orthotic. I am Icing 2x a day and use my orthotics most of the time. Should I be doing the strengthening exercises daily? Dr Blake's comment: First of all, all we are sure off is that you have arch pain. Pain at the navicular does not mean you have posterior tibial tendon problems. That being said, pain in any area should be treated with strengthening as much as possible. As you do foot strengthening as in the video below, see what muscles are weak and emphasize them. If it is the posterior tibial tendon, then that may point to PTTD. Will this tendon quiet down again now that I am not aggravating it? Dr Blake's comment: Typically it will. But, you should ice 3 times a day for 10 minutes, gradually strengthen the area, wear supportive shoes/taping/orthotics as you increase activities, gradually stress it with a progression of activities from slight to more stressful on the area. I would be willing to come see you if you think you can help me. I have what seems to be a stubborn adventitious bursa under and around my fifth metatarsal that developed because my foot was very supinated. Dr Blake's comment: A bursae is a fluid filled sac that develops between the bone and soft tissue, deeper than a blister, in response to abnormal pressure. One can see from the video below that over supination will cause excessive pressure on the outside of the foot. I've been able to stretch and ease the peroneal tendons that seemed to be causing the supination. Dr Blake's comment: As the foot supinates, or rolls to the outside, the peroneal tendons must be strong to stabilize. Focus you attention on strengthening the peroneal tendons. The video below emphasizes the peroneus longus exercise with the ankle in neutral. If you do the same exercise with the foot pointed downward, you will also get the peroneus brevis tendon. The burae comes back with any type of pressure, even stretching. Dr Blake's comment: Once the bursae forms, even normal pressure can keep it irritated. I love deep ice massage three times daily to try to break it down, physical therapy with ultrasound and deep friction massage if self treatment is not successful, and injections or surgery if those are unsuccessful. You must off weight the area on a daily basis. You need a dancer's pad not for the first metatarsal, but for the fifth metatarsal. See my video from yesterday on using 1/8th inch adhesive felt from www.mooremedical.com to create an off weighting system in all your shoes (great if you can attach this to your orthotic device). Dr Blake's comment: I like the old beating up of these bursae, and I have no experience with cold laser. I like, and have good results with cortisone shots when the icing and PT not help. The surgery is rare, so I would not go there right now. Get an MRI if it is stubborn to make sure you are really dealing with a bursae and not another cause of a soft tissue mass. Good luck!! I have nerve pain that presents around the 1st MTJ pad, but is centered between the 1st and 2nd MTJ pad has stopped me running and severely effects my ability to walk normally. Dr Blake's comment: This is either a local problem with the deep peroneal nerve, or an L4/L5 Disc Issue. My GP took an xray to rule out fracture. He thinks it is a neuroma and has referred me to a podiatrist, but I won't be able to get in for another month. As you know that's a long time for a runner, and I hate to be doing anything that would make it worse for a month. So my question is, is contrast bathing good for nerve pain? Dr Blake's comment: Patients with nerve pain love contrast bathing in general since it soothes the nerve by removing inflammation from around the nerve. That seems like something fairly benign that I could start doing right away. In my desperation, I also grapped some Dr. Scholls metatarsal pads and am experimenting to see if I can find the right spot for placement to see if it addresses the pain. Dr Blake's comment: Go to www.mooremedical.com and order a roll of 1/8th adhesive felt. You will have more flexibility in where you put padding. Be creative!!! Which leads me to my deeper question. I have heard a podiatrist say that a neuroma is a symptom of some underlying issue that caused the nerve to fire off in the first place, and that the underlying cause should be found and addressed in addition to treating the actual neuroma. Is that the way you approach it? Dr Blake's comment: Nerves fire bad for many reasons. It can be the nerve itself locally, it can be just a symptom that the nerve is stressed somewhere above (double crush syndrome), and it can be from an outside irritant from poor mechanics, bone spur, swelling in the area from a broken bone, etc. You have to treat the nerve, but not have tunnel vision and also look for other reasons the nerve is unhappy. Thanks for this blog! It has been very informative. This video discusses the common orthotic mold corrections utilized by labs for correcting supination problems.